Market price：1,1,2,3-tetrachloropropene is one of the important intermediates for the preparation of the chemical herbicide, the mazogen. It has recently been discovered as a major intermediate for the new generation of environmentally friendly refrigerant HFO-1234yf (2,3,3,3-tetrafluoropropene). At present, there is a large demand for pesticide grades in China, and the demand for refrigerants is larger internationally. The major foreign producers are international companies such as Honeywell, Monsanto and Japan Daikin Industrial Co., Ltd. The demand for this project is huge, and the future market is immeasurable. Route of Synthesis：This project uses 1,2,3-trichloropropane as a raw material to synthesize 1,1,2,3-tetrachloropropene through a dehydrochlorination process, a chlorination process, a rectification process, and the like. 3E storage tank exhaust condenser | graphite, F = 5m2 | 8 equipment quantity: dehydrochlorination process 169, chlorination process 344, rectification process 285. Due to the large number of devices involved, it is not exhaustive here. Wastes：Wastewater is 1,200 tons/year, exhaust gas is 1,470 tons/year, and solid waste is 160 tons/year. 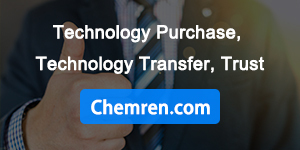 This project uses 1,2,3-trichloropropane as a raw material to synthesize 1,1,2,3-tetrachloropropene through a dehydrochlorination process, a chlorination process, a rectification process, and the like. ≥99% fine 3A self-reservoir is pumped into the high-level tank by batch pump, and 22% liquid alkali is pumped into the reaction tank by batch pumping to the alkali high-level tank. Quantitative catalyst (quaternary ammonium Salt) is put in by the feed port. The temperature in the autoclave is controlled at 60 to 70 ° C, the reaction pressure is normal pressure, and the material in the reaction vessel is mixed and mixed for 2 to 3 hours with a stirrer and a pump. After the reaction is finished, distillation is carried out to separate the oil and water, and 2E is condensed by the condenser and then flows into the 2E storage tank for temporary storage, and at the same time, non-condensable gas is generated, and the bottom liquid residue is sent to the high-salt wastewater transfer tank. The above obtained 2E is continuously driven into the chlorination reactor by the pump, and the metered 99.5% liquid chlorine is continuously introduced into the reactor through the gasifier, and the reaction is exothermic, and the reaction temperature is controlled at 15 to 25 ° C, and the reaction pressure is 0 to 0.05 Mpa. The material is circulated by the pump and cooled by a cooler to control the temperature, and the temperature is maintained for 2 hours to fully react the materials in the kettle. The HCl produced during the reaction carried a small amount of Cl2 to give off (G12), and the product 4A entered the crude 4A storage tank for temporary storage. The crude 4A/5A mixed chloride obtained by the above reaction is continuously heated by the heat exchanger after the temperature adjustment by the pump of the rectification tower feed storage tank through the preheater, and then continuously enters the tower from the middle of the rectification tower, and is continuously separated by atmospheric distillation. The temperature of the column is 200 ° C, the temperature of the top of the column is 160 ° C, the light component gas 4A is fed into the top condenser from the top gas phase tube, and the condensed material is fed to the liquid separator. The liquid is divided into two streams: one is fed into the top as reflux liquid, and the other is fed into the top as reflux liquid. One through the cooler and then into the 4A storage tank. The rectification process produces a partial non-condensable gas. The bottom material is the first fine 5A, which is pumped into the preliminary fine 5A storage tank for temporary storage. 14A dehydrochlorination to obtain 3E (trichloropropene) intermediate 4A is pumped into the reaction tank from the storage tank in batches by a pump, and the quantitative catalyst (quaternary ammonium salt) is added in batches from the feeding port, and the measured amount is 22%. The liquid alkali is pumped into the reaction kettle by a large tank and pumped into the metering tank. The reaction was carried out under a reduced pressure, and the reaction pressure was controlled to be 250 mmHg (negative pressure), the reaction temperature was 100 to 120 ° C, and the reaction time was 4 to 5 hours. The materials in the reaction are mixed and stirred by a stirring and circulation pump. At the end of the reaction, fresh steam is introduced for steam distillation, and the distillate is condensed by the condenser to produce non-condensable gas. The material 3E is pumped into the 3E4A large storage tank, and the distilled residue is sent to the high-salt wastewater transfer tank. The intermediate 3E is pumped into the metering tank in batches and then put into the chlorination reactor. The quantitative 99.5% chlorine gas is introduced under the mixer and pump mixing cycle, and the reaction is exothermic. The reaction temperature is controlled at 25-35 ° C and the reaction pressure is 0- 0.05 Mpa, reaction time 4-5 hours, cooling through the reactor jacket and two heat exchangers, this process produces gas. After the reaction is completed, the pump is pumped into the 4A storage tank for temporary storage. ≥90% of primary fine 5A is heated by the preheater from the rectification tower feed storage tank, and then enters the distillation column tower in batches, heating and heating, controlling the temperature of the tower to be 130 ° C, the temperature of the top of the tower is 110 ° C, using a vacuum pump Vacuum distillation is carried out under reduced pressure (-700mmHg). After several partial liquid phase vaporization and partial gas phase condensation in the tower, fine 5A is obtained, which is transferred to the storage tank for temporary storage. A small amount of non-condensable gas is discharged from the mechanical pump by the condensing process, and the distillation is performed. The liquid enters the tar collection tank. The separated and purified intermediate 5A is pumped into the 5A dehydrochlorination reaction tank by pump, and the metered catalyst (quaternary ammonium salt) is added in batches from the feeding port, and the measured 22% liquid alkali is divided into large storage tanks. The batch is pumped into the metering tank and added dropwise to the reactor. The material is mixed and stirred by a stirring and circulating pump, and is cooled and temperature controlled by a cooler while circulating. Control the reaction temperature 115~125 °C, normal pressure, reaction time 5~6 hours. A pH meter probe is installed in the circulation line to track the reaction. After the completion of the reaction, the crude product 4E was transferred to a 4E water washing kettle and washed with water to separate layers. The upper oil phase is transferred to the crude 4E receiving tank, and then pumped into the crude 4E large storage tank for temporary storage. The upper water layer is sent to the high-salt wastewater transfer tank, and a small amount of 5A and other exhaust gas is produced in the water washing process. The crude product 4E is fed into the distillation column reactor from the rectification column feed storage tank by a batch of pumps. Heating and heating, controlling the temperature of the column to be 140 ° C, the temperature at the top of the column is 120 ° C, vacuum distillation is performed using a vacuum pump (-700 mmHg), and the gas of the front fraction E is discharged from the gas phase tube at the top of the column, and is condensed and cooled by the condenser. The fraction 4E is received by a tank and used as a pesticide specification product (4E). The main fraction 4E gas is discharged from the gas phase tube at the top of the column, condensed and cooled by the condenser, and switched into the rear fraction 4E to receive the tank, and then pumped into the large storage tank of the tank area for storage as a refrigerant specification product (fine 4E). The non-condensable portion generated by the condensation process is absorbed by the water in the water ring pump, and is partially released by the water ring pump + mechanical pump. The rectified raffinate enters the tar collection tank.